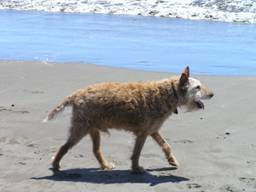 Our beloved Irish Terrier Newton became paralyzed in his rear legs at the age of 13. The paralysis occurred gradually over a couple of months until he lost all feeling in his legs. It was most likely caused by spinal injury sustained when he fell down the stairs. The paralysis was devastating to Newton as it was to us because he was such an independent little guy. He could do nothing without our assistance now. Rather than subjecting him to spinal surgery at his age, we decided to try our luck with acupuncture. Newton started to see Dr. Fong who was highly recommended to us. 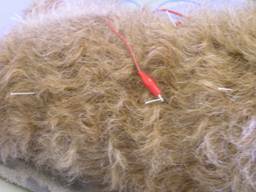 Initially when Newton received acupuncture treatments, electric stimulation and various herbs, he did not seem to feel anything. As time progressed, we became more hopeful because feeling seemed to be returning to Newton’s legs. Finally, Newton could also feel his paws but the muscles in his legs had atrophied so he still could not walk. This is where Kristen Hagler’s expertise became an essential component of Newton’s healing. Trained in canine physical rehabilitation, Kristen developed a customized rehab program for Newton which we followed daily for several weeks. 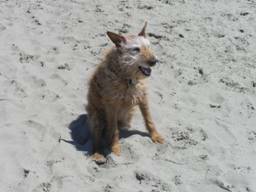 In less than 5 months after Newton’s first appointment with Dr. Fong, Newton took a walk on his own on Stinson Beach. It was clear that he was thrilled with his regained freedom. No one expected Newton to walk again. His recovery was exciting and truly amazing. To this day I am grateful to Dr. Fong and Kristen Hagler for giving Newton and us the gift of his independence. "I brought my 4 year old pug to the Animal Wellness Center after he was almost completely paralyzed from the middle of his back down following a Fibrocartilaginous Embolism (FCE). It was so heartbreaking to watch Chino unable to walk, bend down to eat his food, relieve himself without assistance, or even wag his tail. I was so relieved and encouraged after our first visit with Kristen, she really took the time to explain the different treatment options and exercises for us to do at home. 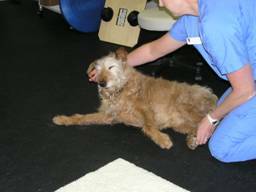 Chino received hydrotherapy, physical therapy, massage and acupuncture with Dr. Hansen. I was so amazed by the level of care and attention he received from the entire staff. I am happy to say that almost 6 months after his FCE he is a new pug! 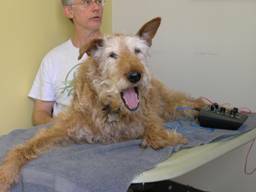 He regained full movement in his back legs and is able to do everything he did prior to the FCE, all thanks to the therapy he received." We appreciate your care, expertise and steady contact through Bubba's tough final months. Your calls meant so much to me/us and the flower essence blends for each dog made a huge difference over this final 5+ days together. Felix and Bubba's completion with each other was clear and loving and "clean." We look forward to working with you with Felix. Our Beagle, Lucy, has had a back disk rupture, twice within two years. She was only 5 years old when the first one occurred. Both times, the ruptured disk material shot upward toward her spine and required surgery to remove since it was causing damage to her nerves. After both ruptures, Lucy’s nerve damage resulted in her being paralyzed from the waist down and was unable to stand or walk. We first took Lucy to see Kristen Hagler a few weeks after her first surgery. Kristen was sincerely caring, very knowledgeable, and just amazing. She helped Lucy recover feeling in her legs, retrained her how to use them, and after a few months Lucy was energetic, walking with only the slightest hint of a skip in her rear legs, and back to her mischievous self. Several months later, Lucy had a second disk rupture, which caused greater damage to her spinal cord. Several weeks after surgery, Lucy was not able to feel any sensation in her toes and she still had a urinary cather in place since she could not control her bladder. We were told that Lucy’s chances of walking again were slim and that we may have to “decide what to do” since Lucy was not able to stand or go to the bathroom on her own. We weren’t able to see Kristen for the first couple months after Lucy’s surgery but Kristen gave us advice on how to get feeling back into Lucy’s legs and prevent muscle loss by using Passive Range Of Motion, Sit-Stand exercises, and other helpful exercises. Lucy regained feeling in her toes, her muscles got stronger, and she was able to pull herself to a standing position. When brought Lucy to Kristen again, she created innovative rehabilitation exercises that were fun and engaging. With a lot of dedication and dog treats, Lucy eventually regained the ability to walk short distances (although, like a drunken sailor), and we got her a doggy cart to help. Kristen showed us how to adjust Lucy’s cart so it could be used to strengthen her abilities instead of hinder her rehabilitation. After several months of working with Kristen, Lucy can now walk longer distances without her cart, and has started to run a bit though her back legs don’t always keep up. She is happy and loving life, and has gone through a lot without ever complaining. We wholeheartedly believe that if Lucy hadn’t received PT from Kristen, she may not have walked after her first disk rupture. I mean really - how do you re-teach a dog to walk? Well, just ask Kristen. 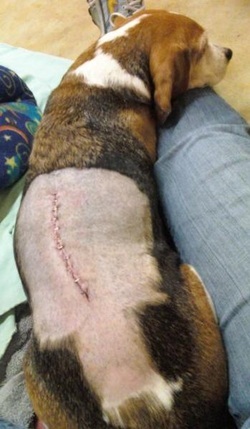 And for Lucy to walk after the second disk rupture is a miracle - even her surgeon is amazed at her progress. Kristen is very attuned to the needs of her patients and she really knows her stuff. We are so grateful for Kristen’s expertise and help, and that we never had to reach that point of having to “decide what to do” with an invalid, but very very loved member of our family. And as far as Lucy is concerned, she just really looks forward to her “play dates” with Kristen and her pocket full of treats!